In our last blog we discussed furniture-style design features in the kitchen being on the rise. A look also expected to be big in 2015 is making your bathing area a “natural beauty”.Turn your bathing area into one that is welcoming and serene, drawing design inspiration from nature. To incorporate this trend, introduce earthy materials like natural stone or timber-look tiles to your space. 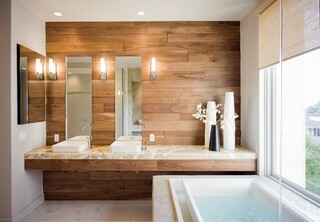 The luxe bath zone above features marble floors and an onyx benchtop, as well as a walnut-plank feature wall. To speak with a design professional about making your bathing area a “natural beauty”, contact Ray Floyd at Re-Builders at ray@rebuildersmyrtlebeach.com.